Nancy Lecompte writes to introduce her new Research Journal Blog titled Gwilodwôgan. The word refers to exploration or investigation in the Western Abenaki dialect. She will be exploring what is known about families with potential Native American heritage in the Northeast, one family at a time. It is her hope the blog will serve as a teaching tool for any beginning researcher, a resource for descendants, and a journal of what is known, what is still left to learn, what is incorrect (and why), and what her conclusions are (and why) for each family examined. She will begin with Edward Marden (also Mardin), c1751-1835 of Lyman, NH, who is said to have an “Indian” wife. His grandchildren are scattered all over the Northeast (ME, NH, VT, Quebec, MA). The next family she will examine is that of a woman named Marleah Kanistaux of Stockton, NY, who is said to be the granddaughter of Metallic. Metallic was a rather famous Abenaki man known in western Maine and northern New Hampshire. He died in Stewartstown, NH in 1845 at an age well over 100 years. She will be looking for another family to work on this summer. If you have an interesting “Indian” puzzle, write and share it. You can email Nancy at nancy@nedoba.org. We’ve started a Maine Genealogical Society Facebook Group! It’s a new way to communicate and interactively share information and conversation. Post queries and join discussions. Here is a pleasant surprise: the Internet Archive is placing the 1930 U.S. Census online and is making it available at no charge. This is a “work in progress;” but, the census records from many states are available now, and the remaining states will be added in the near future. The records are offered in exactly the same format as the microfilms created by the U.S. Government. In fact, the online images appear to be copies of the microfilms. The images are being offered “as is.” That is, there is no index available, only the images. If you already know where your ancestor lived and (hopefully) the enumeration district, you can view the images one at a time until you find the information you seek. You can find enumeration districts on FamilySearch at http://www.familysearch.org/Eng/Library/fhlcatalog/supermainframeset.asp?display=subjectdetails&subject=870702&subject_disp=Census+districts+-+United+States&columns=*,0,0. Once you know the enumeration district, return to the Internet Archive at http://www.archive.org/details/1930_census to conduct your search. If your ancestors lived in a small town, you can probably find them without determining an enumeration district in advance. However, for those who resided in cities, the enumeration district is a valuable piece of information that allows you to zoom in on the correct neighborhood quickly although you will still need to look at a lot of images to find what you seek. While it is nice to see a free version of the census available, I doubt if this will have much impact on the commercial companies that also offer census images online for a fee. The commercial companies have indexed most of their records, and finding someone in an index first is much, much easier than manually looking at hundreds of images in search of the right family. While I appreciate the free, unindexed images, I’ll still gladly pay a few dollars a month to have an index available. I suspect most others will do the same, especially after trying to find someone in the free records. Of course, now is an excellent time for your genealogy society or historical society to index the records for your area and place your own index online, with each entry pointing to an original record on the Internet Archive. To find the 1930 U.S. Census records on the Internet Archive, start at: http://www.archive.org/details/1930_census to conduct your search. We are happy to report that our northernmost chapter, Aroostook County Genealogical Society, is now online with a new website. Visit them at http://www.ac-gs.org. The website is still undergoing some tweaking and they are working diligently on adding additional content, but it is already a great resource. Surf over and check them out and welcome “The County” to the Internet! Here’s a site you might not think of for genealogical research – The Center for Disease Control and Prevention’s website provides links to those who want to direct access to individual state and territory information. To use this valuable too, you must first determine the state or area where the birth, death, marriage or divorce occurred, then click on that state or area. The site does provide guidelines to help ensure an accurate response to your request. The website of the Registry of Deeds Office, Kennebec County, Maine contains a searchable database of their Land Records and Plans databases. Index information and document images that you’ll see available on the website date back to the late 1700’s. Please visit the Registry of Deeds Office website at https://gov.kofiletech.us/ME-Kennebec/. If you have French-Canadian ancestry, you probably have encountered the term “Filles du Roi” at some point in your genealogy research. Millions of today’s Canadians and Americans can find one or more of the Filles du Roi in the family tree. I thought I would explain the term this week and also provide some historical background information. 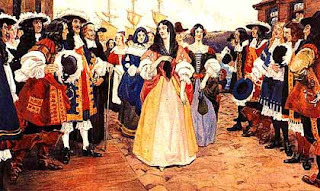 daughters of the King.” Between 700 and perhaps 1,000 young, single women traveled to Quebec City, Trois Rivières, and Montréal from 1663 to 1673 as a part of a program managed by the Jesuits and funded by King Louis XIV. These hardy immigrant women married and raised families. In fact, many of them raised large families in the tradition of the day. Many of their sons and daughters went on to also have large families, and so on and so forth for generations. As a result, millions of living people are descended from this group of pioneer women. In the mid-1600s, most of the people arriving in what was then called New France were young French men intent on farming or fur trapping. Relatively few women traveled to the new land, which created a problem for these young men: there were very few women of marrying age. As if the farmers and fur trappers didn’t have enough competition finding wives, King Louis XIV sent almost 1,200 soldiers of the Carignan-Salières regiment to Québec in 1665 to fight the Iroquois Indians, who were aggressive and killed many settlers. The soldiers were deployed at strategic points of the territory to defend the colony and its residents. The regiment was successful, and a peace treaty with the Iroquois was signed on July 10, 1667. The Regiment then returned to France but left behind 400 soldiers and officers, aged between 19 and 30, who all agreed to remain in the country as settlers. With an additional 400 young men added to the colony, the marriage problems worsened. Jean Talon, intendant of New France, carried out the colony’s first census. He recorded that the population was a bit more than 3,000, with 719 unmarried males and only 45 unmarried females living in the colony. This did not bode well for the future of the settlement. In the custom of the day, the oldest daughter of a family in France received as large a dowry as possible from her parents to improve her chances of marriage. Dowries often included furniture, household articles, silver, land, or other inherited goods. Younger daughters of the same family typically received smaller dowries. Daughters of impoverished families often received no dowry at all, which reduced their chances of finding a suitable mate. These younger daughters were prime candidates for an opportunity in the New World. Their travels must have been difficult. In 1664, the Conseil Souverain reported to the French minister for the colonies, Jean-Baptiste Colbert, that sixty of the 300 people who embarked at La Rochelle the previous year had died at sea before reaching New France. In France Madame Bourdon was made responsible for one hundred and fifty girls whom the king sent to New France in vessels from Normandy. She wrote that the young women in her charge gave her plenty of exercise during such a long voyage since they were of all kinds and conditions. Some were very badly brought up and very difficult to handle. Others were better bred and gave Mme. Bourdon more satisfaction. There are many contradictory stories about the origins of these women. Some stories claim that they were mostly prostitutes who were forced onto ships in French harbors and sent to New France against their will. Other stories claim that these women were mostly recruited by Jesuits who insisted upon accepting only women of the finest moral character. The truth is probably somewhere between these two extremes. About 40 Daughters, called Daughters of Quality (filles de qualité), were from wealthy upper class families and had dowries of over 2000 French pounds. Several of the Daughters of Quality have provable descents from royalty. The vast majority of the group was of French origin, although there were girls of other nationalities as well. According to the records of Marie de l’ Incarnation, who knew many of these women, there were among them one Moor, one Portuguese, one German, and one Dutch woman. Those who arrived safely usually found husbands within a few weeks. In fact, there are records of some of the young women marrying within days after their arrival in New France. Since many of them produced large families, hundreds of thousands – if not millions – of people in North America today can find one or more of these young women in their family tree. If you do not read or speak French, the above sites can be translated into English by using the machine-generated translation services available at Google. The results will be grammatically incorrect and even humorous at times, but still quite readable. There are many other Web sites devoted to the Filles du Roi. Use your favorite search engine to find them or click here for a search on Google. Nancy (Coffin) Lecompte has written advising of updated addresses for her websites containing not only her genealogical information, but some historical information which might be interest to researchers as well. The Stevens Clan & 4 generations of Ancestors. This one covers her Irish Burns/Sullivan and English Stevens/Perry lines found in Lewiston, Auburn and Minot area of Maine. Nancy’s Proctor ancestry, including a brief history of Early Falmouth (Portland) with 1775 Map and her family involvement in the Salem Witch Trials. Descendants of Samuel Proctor (1685-1765) of Lynn, MA & Falmouth, ME attempting to identify and document at least 4 generations of descendants. A brief accounting of the military service of Nancy’s ancestry during the American Revolution with notes on important events, etc. A story of Maine Men serving at Cherry Valley and in the Sullivan Campaign in the New York Theatre of War. An Account of the Event and Identity of the Soldiers who Died or were taken Captive by the British and Their Indian Allies. And don’t forget to visit Nancy’s Ne-Do-Ba website at www.nedoba.org – Your home for accurate historical and genealogical information concerning the Wabanaki People of the Northeast. What Was Your Ancestor’s Property Worth? Genealogists often find references to money in old deeds and other documents. Even U.S. census records frequently recorded estimates of a person’s real estate. The naturally question is, “I wonder what that would equal in today’s dollars?” There is a web site that can answer this question. S. Morgan Friedman’ Inflation Calculator can convert a U.S. dollar amount for any year from 1800 through 2008 into the equivalent amount, adjusted for inflation, in any other year of that range. In other words, if you find that your ancestor purchased land for $400 in 1805, the Inflation Calculator will tell you that the money he spent is equivalent to a purchase of $5667.99 in 2008. This should be sufficient for genealogy purposes. The pre-1975 data comes from the Consumer Price Index statistics published in the Historical Statistics of the United States (USGPO, 1975). All data since then is from the annual Statistical Abstracts of the United States. You can access the Inflation Calculator at: http://www.westegg.com/inflation. Canadians will find a similar Inflation Calculator for the years 1914 through 2009 at the Bank of Canada’s Web pages at: http://www.bankofcanada.ca/rates/related/inflation-calculator/.